Specifications :Type of Product : Single Solenoid ValveSub Type : Big Coil TypeModel No. : AK-SSVBC-.. Features & Specifications :Compact Design 5/2 Way Single Solenoid Valve 1/4"Voltage: Available O.. Features & Specifications :Model : 2ADDS - 504Size : 1/2”Body : Aluminum AnodizedSeals : Nitrite.. Features & Specifications :Compact Design 5/2 Way Single Pilot ValveEnd Cover : AluminumSize : 1.. Features & Specifications :Compact Design 5/2 Way Double Pilot Valve 1/2"Size : 1/2 InchPressure.. Features & Specifications :Model : 2ARMSS-5Size : 1/2"Body : Aluminum Press. Die CastSeals.. Features & Specifications :Model : 2ARMDS-5Size : 1/4"Body : Aluminum Press. Die CastSeals : Nit.. Features & Specifications :Model : 2ARMDS-5Size : 1/2"Body : Aluminum Press. Die CastSeals : Nit.. 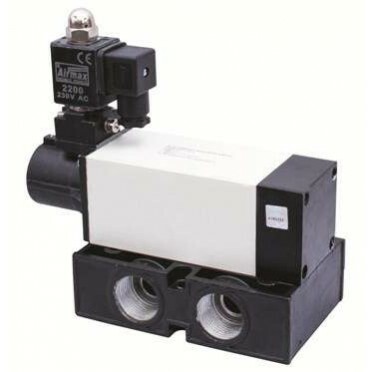 Features & Specifications :RM Series 5/2 Way Double Pilot Valve 1/2"Media : Air (Filtered & .. Features & Specifications :Airmax SIKO Series 5/2 Way Push Pull Valve 1/4"Media : Air (Filtered ..